Implantation is the penetration of the growing structure to the uterine endothelium. It occurs approximately 8 to 10 days after fertilization. Immediately after fertilization, the fertilized ovum or zygote stays in the fallopian tube for 3 days. During this time a rapid cell division (mitosis) or cleavage is taking place. The first cleavage occurs at about 24 hours and it continues to rapidly divide at a rate of one in every 22 hours. The developing cells are now termed as BLASTOMERES. When 16 to 50 blastomeres (developing cells) are present, the cells tend to create a bumpy appearance and it is now called MORULA. Morula comes from a Latin word “morus” meaning mulberry. In this morula form, it will start to travel by ciliary action and peristaltic contractions of the Fallopian tube to the uterus. It continues to multiply as it floats free in the uterine cavity for 3 or 4 days. Large cells tend to accumulate at the side of the structure. Because of this peripheral accumulation, a fluid space surrounding the inner cell mass is created. When a cavity is formed in the morula the structure is now called a BLASTOCYST. 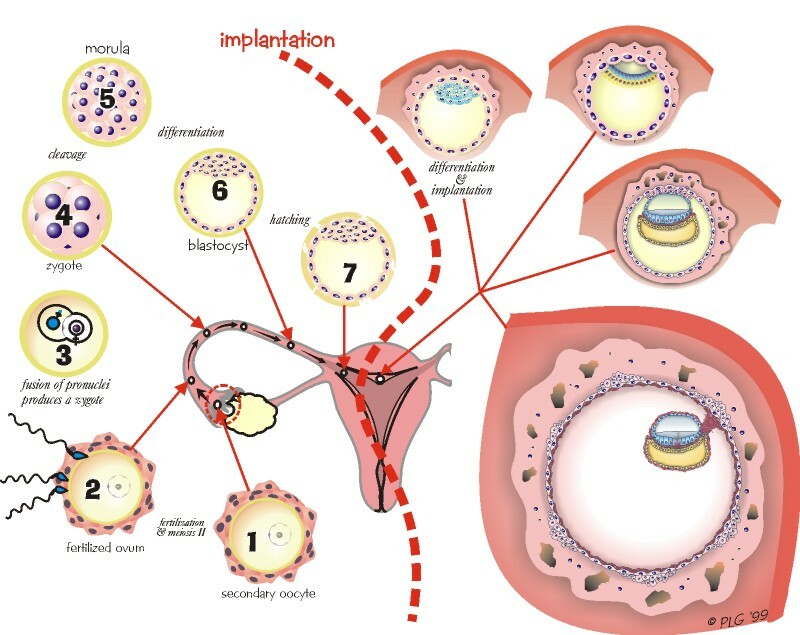 Blastocyst is the structure that penetrates to the uterine endothelium. Cells form on the outer ring of the blastocyst, which are called trophoblast cells. Trophoblast cells enable the blastocyst to invade the endometrium. These cells will later form the placenta and membranes. The brushing of the blastocyst to the uterine endometrium is a process called APPOSITION. The attachment of the blastocyst to the uterine endometrium is termed as ADHESION. The settling down of the blastocyst down into its soft folds is a process called INVASION. Invasion is made possible because as the growing structure touches the endometrial wall a proteolytic enzyme is produced that dissolve the tissues that they come in contact with. The blastocyst burrows deep into the endometrial wall to receive nourishment from the endometrial glands. Continued invasion establishes an effective communication network with the maternal circulation. Once implanted the zygote is now termed embryo and the uterine endometrium is now termed decidua.